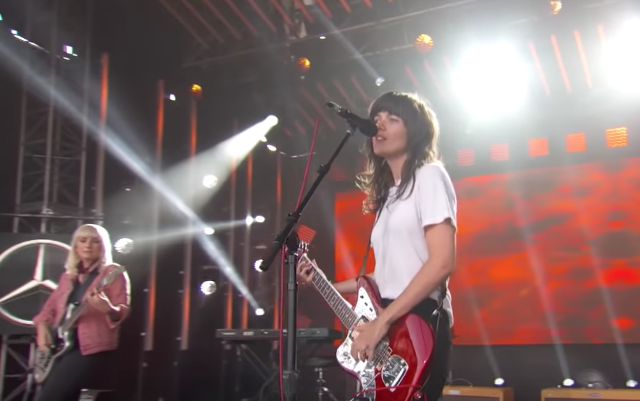 Courtney Barnett is touring behind her recent album Tell Me How You Really Feel right now, and stopped by Jimmy Kimmel Live last night to perform on the show’s large outdoor stage. With swagger and roughshod energy, she ran through two tracks on the album, “Charity” and “Need A Little Time.” Barnett last hit the late night circuit to promote the album in May, performing the single “Nameless, Faceless” (which she also recently performed live with The Breeders) and a bonus backstage cover of Gillian Welch’s “Everything Is Free” on The Tonight Show With Jimmy Fallon. Read our May cover story on Barnett here, and our review of Tell Me How You Really Feel here. Watch Barnett’s Kimmel performance below.